In my previous post, I wrote about a Giant Swallowtail butterfly that visited my backyard in early August, an unusual sight for my area. I sought to learn more about this butterfly species. Adult butterflies seek out areas that contain their larval host plants, those specific plant species that females lay their eggs on and that their caterpillar larvae feed on. Per butterfly field guides, various members of the Rue (Rutaceae) family are the host plants of the Giant Swallowtail. The better known members of this family are citrus trees like sweet orange (Citrus × sinensis). That’s why the Giant Swallowtail is so common in Florida. Farther north, native members of the Rue family include Prickly Ash (Zanthoxylum americanum) and Common Hop Tree (Ptelea trifoliata). 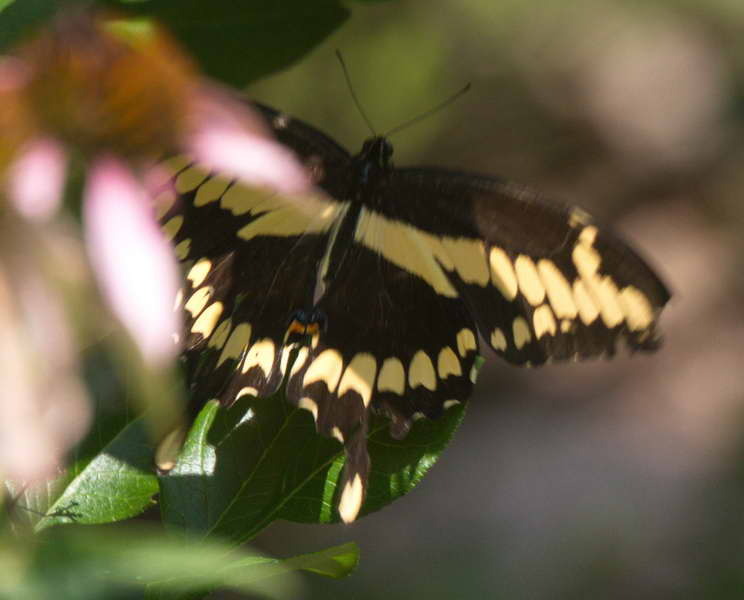 Why did the Giant Swallowtail visit my yard? Although both Prickly Ash and Common Hop Tree occur in northern New Jersey, I’m not aware of any growing in or near the woods surrounding my yard. But the Giant Swallowtail that visited my yard on August 3 seemed to be interested in something, as it flew back and forth in wide arcs for about five to ten minutes. I noticed that it kept returning to a clump of Purple Coneflower (Echinacea purpurea) that was past its flowering prime. I figured that those flowers still had a bit of nectar to feed a hungry butterfly. That evening, I did additional research and found several resources that reported that the Giant Swallowtail also uses nonnative ornamental species of the Rue family as larval host plants. 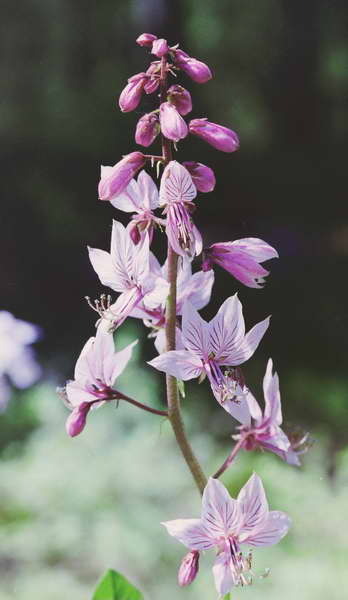 These ornamental species include Gas Plant (Dictamnus albus), Mexican Orange (Choisya ternata), and Herb of Grace or Garden Rue (Ruta graveolens). I then realized why the Giant Swallowtail in my yard kept returning to that single clump of Purple Coneflower. My recollection, confirmed by several blurry photos, was that the butterfly often just climbed over the clump of flowers to linger among the leaves of a mature Gas Plant that was growing behind it. The Giant Swallowtail must have been a female looking to lay eggs on the Gas Plant. The next day, I searched the Gas Plant for Giant Swallowtail eggs but found none. I continued to search each day and found nothing until August 11, eight days after I saw the adult Giant Swallowtail. 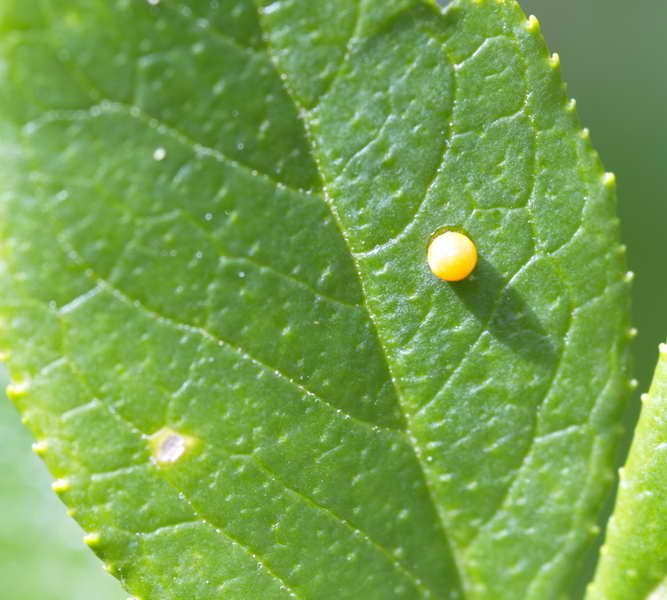 That day, I found a single egg clearly visible on the upper surface of a Gas Plant leaf that matched the description of a Giant Swallowtail egg – round, orange, and about 1 mm in diameter. I was amazed that I had missed seeing it earlier and wondered if another butterfly had visited my yard after August 3. The following day, I discovered two more eggs on the Gas Plant, for a total of three. I continued to check the Gas Plant daily but found no new eggs after the first three. On August 15, a hailstorm blew through. After the storm, the first egg was gone, and I could find no newly hatched larva, so I wondered if the egg was knocked off of the leaf by a hailstone. The other two eggs were intact. On the morning of August 18, both remaining Giant Swallowtail eggs hatched into larvae, ready to start munching on the leaves of the Gas Plant. My next post will have more information about Giant Swallowtail larvae. Gas Plant is native to Europe and Asia. Although I planted it in my garden about 20 years ago, I wouldn’t do so now because I prefer growing plants that are native to my area. Per the USDA PLANTS Database, Gas Plant also has escaped to the wild in a few areas, although it’s not listed in the Invasive Plant Atlas of the United States. It spreads only by seeds, which are catapulted by the seed pods to a distance of several feet, so it’s unlikely to become a serious invader. My Gas Plant has spread in my garden by seed on occasion, so now I remove the spent flowers before the seeds form. Great job discovering the host plant in your garden, and even an egg and larva. Look forward to seeing your additional photos. Thanks for your comment, Deb. I’m looking forward to watching the larvae develop. This was very interesting, Edna, as I also photographed a giant swallowtail last week in Ontario, nectaring on buddleia. It was a large public garden and I have shot honey bees on dictamnus there; there was also rue in the vicinity. 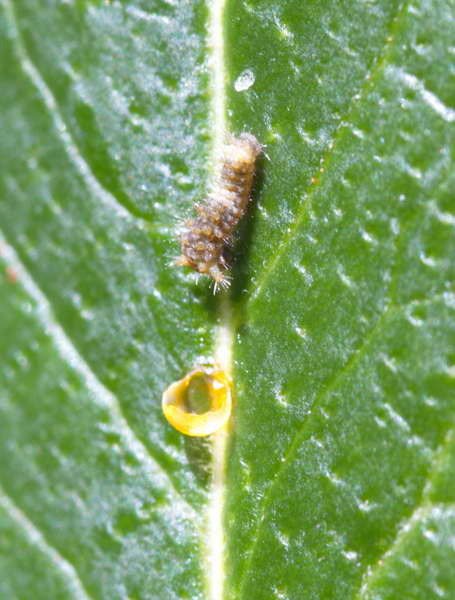 I’ll look forward to seeing your later larval shots. Glad you got to see a giant swallowtail so closely, Kathy. I just saw one in my yard today, here in Central Nebraska. Trying to decide what host plants to try in my garden, that will survive, and attract the Giant! I’ve currently been raising Monarchs indoors and just tagged and released three of them, two were today. I’ve got another 7 eggs I’m brooding inside again and hope to have good success with them, also. Adding another type would be great! I have a video on YouTube of the 3rd one eclosing – such an amazing transformation! I’m hooked! Hi Jeri – thanks for your comments and congrats on your success with raising Monarchs. Gas Plant would probably do well in your Nebraska garden. My Gas Plants have attracted ovipositing Giant Swallowtails for three years in a row now. But be careful with Gas Plant on two accounts. First, it spreads by seeds and can invade natural areas, so it is wise to prune back spent flowers before they set seed. Second, touching the foliage can cause a skin reaction that ranges from discoloration to burning and blistering. It’s best to site the plant away from walkways and play areas, and wash skin and clothing after handling the plant. Thanks! I think I saw something about that plant. My butterfly/hummingbird garden will be at the back of our yard in what used to be a veggie garden. I’ll remember to put a gas plant off by itself so I can keep an eye on it. I’ve had problems in the past with self-seeding plants, so will try to be vigilant! I have sensitive skin, so often wear long sleeves when I’m dealing with garden plants anyway, so shouldn’t be too hard to remember that! Oh! And, I ended up tagging about 35 total monarchs! Thanks, again! Enter your email address to follow Eye on Nature and receive notifications of new posts by email.